If there’s a monogram that truly needs no introduction, it’s Louis Vuitton’s. Once an iconic symbol of international travel, the interlocking LV and floral motif is now a universal denotation of luxury. It’s graced everything from steamer trunks to belt bags and has been flaunted by celebrities on and off the screen. Today, Nicolas Ghesquière and Virgil Abloh are in charge of continuing its legacy and making the monogram more ubiquitous than it already is. Due to its coveted status, Louis Vuitton’s monogram is one of the most counterfeited logos to date. So how can you know real from faux? Take a walk through the Louis Vuitton monogram hall of fame and read Chief Authenticator Graham Wetzbarger’s tips for spotting the real deal. Louis Vuitton’s late 2018 collaboration with Grace Coddington is arguably the cutest monogram to date: the Catogram. Inspired by the pets of both Coddington and Louis Vuitton women’s creative director Nicolas Ghesquière, the collection features cats and dogs popping up between initials and fleurs, while minute mice scurry across the linings of bags. And the bold orange monogram is a reference to the unmistakable mane of Coddington. Louis Vuitton Vernis has certainly seen its fair share of the spotlight. First introduced in 1997 by freshly appointed creative director Marc Jacobs, Vernis (French for “varnish”) has emerged in nearly every color imaginable. The glossy, embossed patent leather most commonly features the monogram, though Louis Vuitton creates Vernis Damier pieces as well. During Marc Jacobs’ tenure at Louis Vuitton, he tapped multiple artists to create unique riffs on the Louis Vuitton monogram. A frequent collaborator was neo-pop artist Takashi Murakami, and the Multicolore line is perhaps his most iconic. Multicolore pieces hit the market in 2003 and were included in the permanent collection until 2015, when it was discontinued. 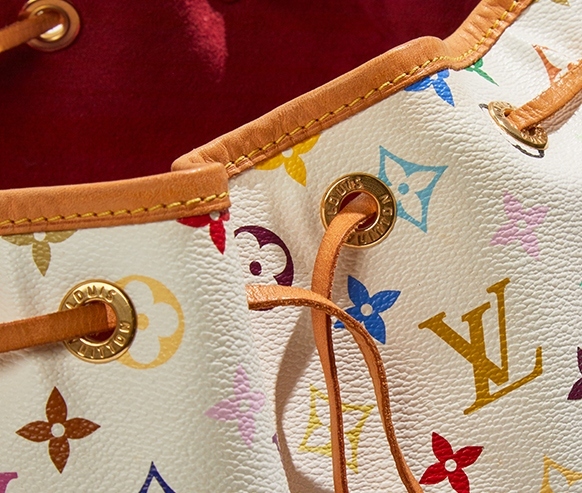 One of Louis Vuitton’s rarest monograms is the Monogramouflage, another Takashi Murakami design. The Monogramouflage made a grand debut in 2008 at the Brooklyn Museum for one of Murakami’s shows. Within the show, a Louis Vuitton pop-up sold limited edition Monogramouflage canvasses, as well as Murakami-designed Monogram Cerises and Multicolore pieces, resulting in an unprecedented art-meets-commerce experience. A dramatic black and red defines the Monogram Infrarouge, Nicolas Ghesquière’s first adaptation of the LV monogram. It premiered on the Spring 2015 runway, and while it seemed to vanish from LV’s offerings as quickly as it appeared, its effects were everlasting. Louis Vuitton’s space-inspired Galaxy collection for men hit during the holidays last year. Four new bag styles — inspired by astronaut gear — emerged with the starry monogram, including the Alpha backpack, Alpha Hobo, Alpha Messenger and a Bumbag (or belt bag). Shop our editors’ top Louis Vuitton monogram pieces now.